Net Weight: Packet (360 seeds)1oz (2000 seeds)(+$6)1/4lb (8000 seeds)(+$11)1/2lb (16000 seeds) (+$18)1lb (32000 seeds) (+$22) This item is currently out of stock! Known as a �spring� radish for its early maturity (versus a �winter radish� such as daikon). This variety is red skinned near the top, paling to white sparklers at the root. Introduced in 1899 to American gardeners. Uniform shaped radishes with small tops. Grows rapidly. Can be planted with carrots or lettuce to mark rows. Takes up very little space so can be planted anywhere. Plant seed outdoors as soon as the ground can be worked. Plant in rows 12 inches apart spacing seeds 1/2 inch apart. Heirloom Radish can also be broadcast in beds. Cover the seed with 1/8 inch of fine soil, well pressed down. Keep moist until seeds sprout. When plants are 2 to 3 inches high, thin plants so that they are spaced 2 inches apart. 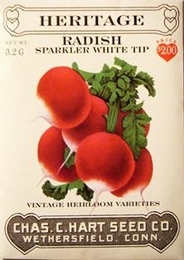 Bulk Heirloom Radish seed available. 2000 Seeds/oz. Plant 1oz per 100ft row. 15lbs of Heirloom Radish seed needed per acre. Average Heirloom Radish yield per acre -475 bushels.